I think we all go through that while knitting sweaters. I measure like crazy but am still paranoid until I actually try it on. I'm a big Jane Austen fan, too! Yes, this edition is beautiful. Thanks. You should definitely give sweater knitting a try...wearing the finished garment is worth all of the fretting. :) But there's nothing wrong with knitting lots of shawls, either! 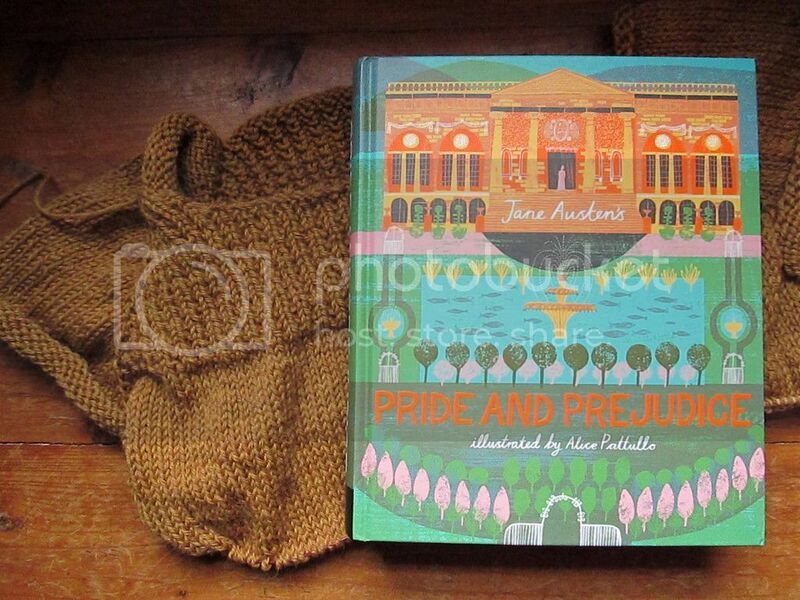 I love Jane Austen but haven't seen an illustrated version, it sounds intriguing! Oh I love Pride and Prejudice! And oh my! I love the color of the yarn you are using! So do I. :) Thanks! Sometimes I think it's a rather unusual shade of golden brown, but most of the time I love it. The book looks absolutely amazing! It is always so fun to re-read old favorites in new format. Enjoy! Your sweater looks lovely, such a beautiful color! Yes, it is fun. :) Thanks! It's good so far, though a little vague at points. :) I'm glad I'm not the only one! This is my fifth sweater for myself, and I've been like this every time, so I guess it doesn't get better, ha! Yes, it definitely is gorgeous. Oh I do like the look of that sweater! I do that second guessing thing with all my garments. The book looks remarkable! That book sounds wonderful! I will look for it.